Use this interactive home search to view current MLS listings of homes for sale (Active) in the Addison subdivision. 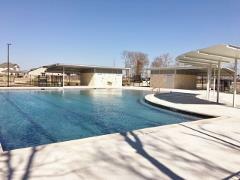 If you would like a tour of homes in Addison, call Jim at 512.913.1557. Neighborhood Location: Addison is located in Southeast Austin. Traveling from Austin on US-71 toward the Austin airport, turn south on US-183 (you will pass ABIA on the left). 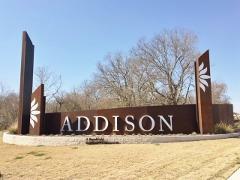 The entrance to Addison is 3.3 miles from this point. Turn right into the neighborhood at Annalise Dr. The sign at the entrance will be on your left. Scroll down to see more info on Addison. The data below from the Addision subdivision provides an overview of home sales activity and home sizes over the past 4 years. Addison Southeast Austin real estate market data from Austin Board of Realtors, 1/1/2015 to 12/31/2018. This development is a project of Brookfield Residential (also developing Blanco Vista in San Marcos). The entire development will cover 195 acres when it is completed. The first MLS-listed home sale in Addison closed on April 30, 2015. Four builders (Buffington Homes, Homes by AVI, Milestone Community Builders and Pacesetter Homes) are at work in February 2018. The work is progressing well. In early 2018, these builders are offering homes that range in size from around 1,300 sq. ft. to more than 3,000 sq. ft., with base prices beginning in the low $200s to the upper $300s. Homes are offered in varying lot widths of 40', 50' and 60'. 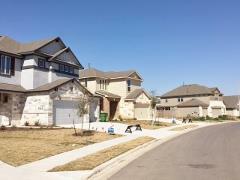 The standard features of these Addison homes vary with the builder. Features that can be expected include a limited new-home warranty, designed-in energy efficiency, modern and traditional home styles, options in exterior look, interior livability and functionality, and either a 1- or 2-story plan. Options for shopping, eating and other "things to do" in the Addison area include many along IH-35 (Lowe's, Home Depot, Chili's, e.g. ), Southpark Meadows (at IH-35 South and W. Slaughter Ln. ; Super WalMart, Target, Sam's and Best Buy, along with eateries, banks, a movie theater, several furniture stores, small businesses, e.g. ), the SOCO (South Congress district, Downtown Austin, and many, many more! South of Austin in Buda, Kyle and San Marcos, there are lots of other options, including a Cabela's outdoor sporting goods store. There are many golf courses available in the Austin and surrounding area. Those nearby include the City of Austin's Grey Rock, Clay and Kizer golf courses, and the Plum Creek and Riverside layouts. 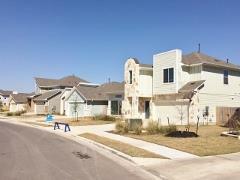 Nearby parks that offer the public varying features and opportunities include the Richard Moya Park (Travis County), the McKinney Falls State Park (Texas Parks and Wildlife) and the Mary Moore Searight Metro Park just off W. Slaughter Ln. (City of Austin). Need to get to the Austin-Bergstrom International Airport (ABIA)? Exit the community to the left onto US-183. Veer right onto US-71 to the airport exit. Take US-183 N, or US-71 to IH-35, to get to Downtown Austin and other locations. 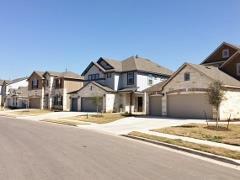 Owners of homes in Addison must be active members of the neighborhood HOA (Addison HOA, managed by Goodwin Management). Taxes in Addison are assessed by two primary entities: Travis County and the Del Valle ISD, along with 3 others. The total tax rate, which varies from year to year, was set at around $2.14/$100 of property value for the year 2017. Basic utilities are provided by Austin Energy (electricity) and Centerpoint Gas (natural gas). Students living in the Addison neighborhood attend schools of the Del Valle School District. Potential Addison homeowners should confirm the current schools assignments with the Del Valle ISD.